Did you know that your horse requires more care in the winter than in the summer? That’s because they need more hay to keep them warm plus water is very important and so is the care of their hooves. There are several factors during cold weather that you need to take into consideration. Horses can tolerate temperatures at or slightly below 0°F. 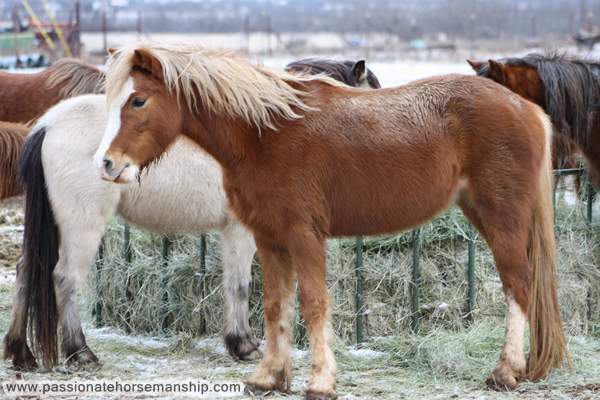 If horses have access to a shelter, they can tolerate temperatures as low as -40°F, but horses are most comfortable at temperatures between 18 and 59°F. This will depend of course on the thickness of their hair coat. Movement is very important for a horses health. I’m a big advocate for turning horses out and letting them roam, they were designed to be moving miles a day. When horses are allowed to move they stay healthier because the movement helps with digestion. When you limit a horses movement it can lead to problems like colic or stocking up of the lower legs. I heard a story about a horse that colicked all the time when the owner put the horse on 24-hour turnout the colic episodes disappeared. During the winter if you ride be careful about riding in deep or wet snow cause it could cause tendon and muscle injuries. The other thing is you don’t want to get your horse sweaty because it will be a challenge to cool them down with the thick winter coat. If you leave them hot and wet it could lead to them getting sick. If you’re going to ride a lot you might want to consider doing a trace clip. In the winter a horse’s hooves grow slower, but they still need to be trimmed. The underside of their hooves are more susceptible to collecting ice or snow during the winter which makes it difficult for them to walk. It also increases the chances of them slipping and falling plus it puts increased pressure on their tendons and joints. So, make sure you clean their hooves daily. I’ve heard of people putting Vaseline on the bottom of the hooves to help reduce the snow build up. Good quality hay is really important in the winter to help them maintain their body temperature. Horses that are older, skinny or ill will need more hay just to maintain an acceptable body condition. Some people think it’s best to give them extra grain to help with weight. That is a myth do not give them extra grain to help them with weight it can create more problems just give them extra hay. Even if you’re feeding good quality hay your horse will consume less if they’re not drinking enough water. If less feed is consumed your horse might not have enough energy to tolerate the cold. Most adult horses weighing 1,000 pounds require a minimum of 8 to 12 gallons of water each day and prefer water temperatures between 45-65 degrees Fahrenheit. Some horses will drink cold water, but most will drink less when the water is cold. Don’t think that the snow will provide them with what they need. Research has shown that a horse cannot stay hydrated by eating snow alone. If you took five gallons of snow it would only be equal to about 1/2 gallon of water. If your horse had to depend on eating snow for their water intake it would use up a lot of their energy to stay warm. For me, I use heated buckets, but if you don’t have access to heated buckets make sure you break the ice in the bucket morning and evening. Be sure to remove the ice after breaking it so it doesn’t refreeze quickly. Before I had heated buckets I used a spaghetti fork to remove the ice from the buckets and for the big trough I used a clean manure fork. Just remember decreased water consumption can lead to colic, so make every effort to ensure your horse is drinking enough. Older horses or those with dental problems may not be able to drink very cold water and may require additional warming of their water. If you use a stock tank heater make sure you inspect it carefully on a regular basis for worn wires or other damage and check the water for electrical sensations or shocks. My husband is an electrician so all of mine are plugged into a GFCI outlet (ground-fault circuit interrupter) so that the horses are protected from electrical shock. Another topic about winter care is blanketing. Do you blanket your horse in the winter? Be sure to read my post about when it’s best to put a blanket on your horse. Now you may be asking yourself when should I leave my horse indoors? If the wind chill is in the low teens or below because wind chills like that are not good for the horse’s lungs and it creates muscle tension. P.S. Consider giving your horse access to loose salt instead of a salt block. Blocks were designed for cattle with rough tongues. Horses that are salt hungry will try to bite off a chunk from the block which could mess up their TMJ. Electrolytes are another good thing to give your horse during the winter. I use DynaSpark from Dynamite Specialty Products. Do you have any tips to add to this? If so please leave them in the comments below.